A general view of the scene outside Volgograd train station, where a suicide bomber attacked on Dec. 29, 2013 in Volgograd, Russia. Fifteen people are believed to have been killed when a bomb went off at a checkpoint at the entrance of the station. Several leading counter-terrorism experts fear that the two terror attacks in Volgograd, Russia that killed at least 34 people on Sunday and Monday --and another suicide bombing in nearby Pyatigorsk that killed three people Friday -- are probes in advance of a larger attack against either the Sochi Olympics or Moscow. The experts, from the offices of the Carnegie Endowment for International Peace in Washington and Moscow, also say that Russia’s security services are ill-prepared to deal with the kind of small-unit operations that produced the bombings, since they have been trained to prevent massive attacks from larger, well-organized groups. That may make them vulnerable to the new strain of Russian terrorism -- streams of jihadis emerging from training camps in the Dagestan forests who have no leaders and no real organizations and are thus hard to find or stop. 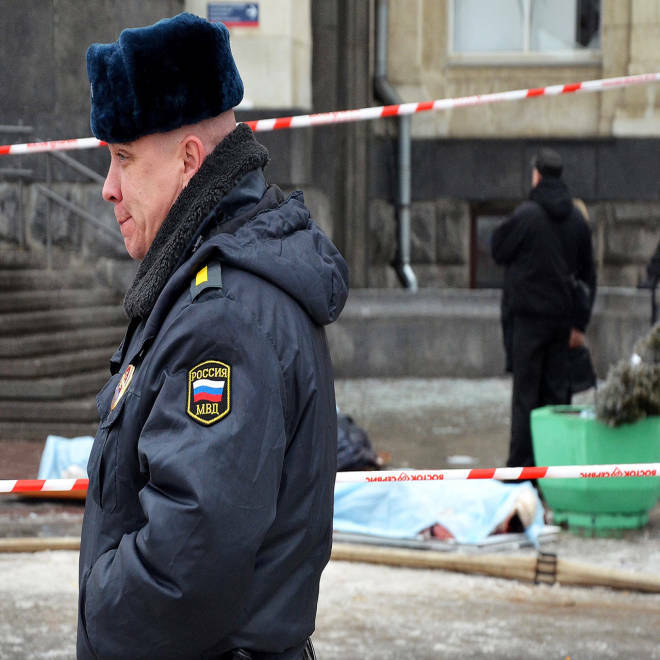 No group has yet claimed responsibility for the Volgograd and Pyatigorsk attacks. In the past, established terrorists, like Caucasian terror leader Doku Umarov, have made public claims of responsibility for successful operations. “There is a big problem as far as Sochi concerned, the penetration of very small groups and individual terrorists,” said Alexey Malashenko, a scholar in residence at Carnegie’s Moscow office. The 22nd Winter Olympics begin Feb. 6 in Sochi, a city in southern Russia close to the Caucasian republics that are the source of much of Russia’s terror problem. Andrew Weiss, the Washington-based vice president for studies at Carnegie, said there was “a sense that the initial attacks are more of a test. The major attacks might be put off till the games." He added that any future attacks could come in cites far away from Sochi. Dmitri Trenin, director of the Carnegie Moscow Center and a former Russian military officer, noted that a week prior to the September 2004 siege of a school in Beslan, in which more than 300 people were killed, almost 200 of them children, there were twin terrorist attacks on Russian airliners flying out of Moscow. A total of 89 people were killed in the suicide bombings that took place minutes apart. Before that, there were smaller attacks in Russia. U.S. counter terrorism officials say that while that scenario of smaller attacks preceding larger ones is possible, their early analysis does not substantiate a progression. However, as one official told NBC News, the U.S. was "not surprised" by terror attacks prior to the Olympics. "We expected something of this nature." There's also agreement that the Russian security forces have focused on stopping attacks like Beslan, and that the lack of centralized control gives terrorists an advantage. “The security services are trained to prevent and repel that kind of attack," said Trenin. "Dealing with smaller attacks and smaller groups, which is now the preferred tactic of the terrorists, that is something the services still have to learn." Added Malashenko, "If for instance, Russian security services are concentrated around the Olympics in Sochi that will facilitate terrorist activity in other cities of the federation, including Moscow." The use of small units does not mean the death toll in attacks will also be small. Weiss pointed out that if the real target in the Sunday train station attack was not the station itself but a train leaving the station, the death toll could have been much higher and more spectacular. The bomber detonated his bomb as he approached the security post inside the railway building. There has been speculation he may have become nervous and prematurely detonated his bomb. The job of stopping terror attacks is made still harder by the recent turn toward “Russian Muslims” as suicide bombers -- meaning ethnic Slavs who have converted to Islam and can blend into Russian society until they’re ready to strike. Russian authorities now say they suspect that the suicide bomber who detonated the shrapnel-filled device at the train station, originally thought to be a woman, was an ethnic Russian male who converted to Islam. The Sunday explosion and a separate attack on a trolley on Monday morning killed 34 and wounded 60. "These ethnic Slavs have been used more frequently as suicide bombers and masterminds," added Malashenko. "When they are converted and enter cells they cut all links to their former lives, to their mothers and fathers. It’s something new that previously we have not known in this country, people converting themselves to Islam and becoming bitter enemies of their former brethren. "We are not talking about the regime, we are taking about interethnic conflict. Terrorists thrive on ethnic Slavs turning against the people from the Caucasus." It is believed that the suicide bomber in the train station attack and the bus bombing in Pyatigorsk were both ethnic Slavs. The analysts agreed that the choice of Slavs also served as a message the threat was expanding. The identity of the trolleybus bomber remained uncertain Monday night. "There is a policy, if you can talk about a policy, on behalf of those who mastermind terrorist to recruit more people of Slavic origin," added Trenin. The attacks, say both the Carnegie experts and U.S. counter-terrorism officials, are likely to increase cooperation between the security and intelligence services of the two countries, although for the most part it will be limited to protecting U.S. athletes coaches and visitors. "You can be sure we're taking a hard look at this," said one U.S. official, who added that the new security assessment for the Olympics isn't going to wait that long. The Olympics begin in five weeks.